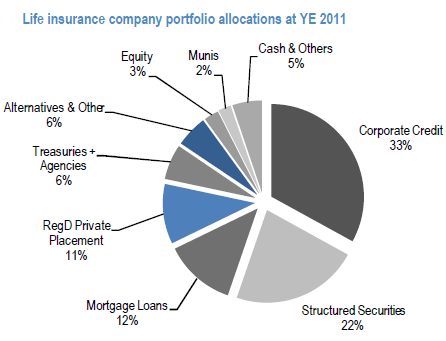 JPMorgan recently performed a study on the composition of portfolios managed by life insurance companies. The study looked at the top 20 life insurance firms using their regulatory filings. These are the portfolios set up to support projected policy claims. The reason it is important to measure the composition and the changes in such portfolios is that life insurance firms manage $1.9 trillion in assets. Here is the current breakdown. 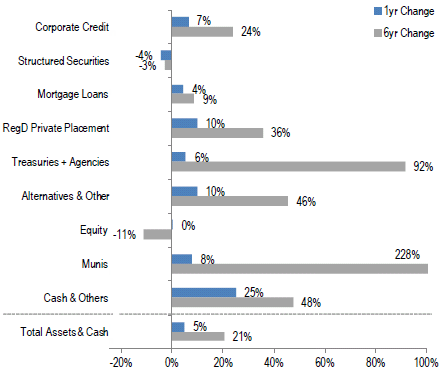 What stands out is that a third of the allocation is to corporate credit. That bucket includes both IG and HY, with a rating of A and higher making up nearly half of the allocation. BBB bonds make up 43% of the corporate credit allocation, leaving about 8% for HY. The next chart shows dollar changes across the allocations over the past one year and also six years. It demonstrates how life insurance firms have provided the bid for investment grade corporate credit. There has been a substantial reduction however to bonds of financial firms. 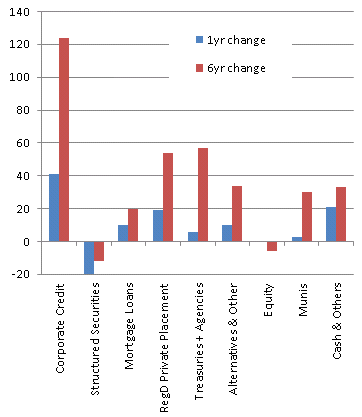 The other major declines have been in structured credit and equities (aging population forces these firms to reduce riskier assets as disused earlier). Structured credit has included a rebalancing toward ABS (pooled credit cards, auto loans, etc. ), which are short maturity and have performed well. On a percentage basis we see a large increase in treasuries and agencies as well as munis. JPMorgan attributes this to the fact that there is a limited supply of high quality spread product: "there is a shortage of spread Fixed Income product which is contributing to the growth in Treasury holdings." Going forward it will be increasingly difficult for life insurance firms to meet their portfolio growth requirements as spreads and yields are now near historical lows. That will translate into reduced earnings for these firms as more of the premium would need to be put away to meet policy claims.